Games like Empire, Napoleon and Shogun 2 have made harder not only the modding but also the running of the mods. Players often feel the ugly experience that they have to be modders themselves in order to install and run their favorite mod(s). Soon, the game installation is fool of several mod files causing crashes and the re-installation of the game is not a rare case at all. These problems can be reduced significantly with the use of a launcher which is able to automate the procedure. Creating a launcher is my most favorite modding work (well.. after startpos editing...). Some of the most popular mod use one of my launchers and that helped me in getting know better the needs of the players for running a mod and maintain the game/mod installation unharmed. For some time now, I was working on making a utility that would speed up the procedure of creating a launcher and would save me a lot of time by automating some of the coding routines. On the way I decided to expand further this utility and offer it to the community. Easy Launcher is a “developing” tool that will help the user make a launcher for a mod in a few minutes, without the need of entering a single line of code or scripting! All you need to have is a... working mod! The produced launcher will run mod easily, with only one.. click! 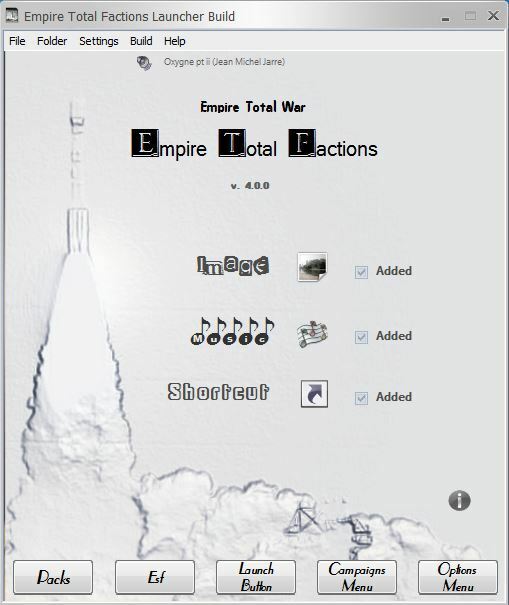 Creates a launcher for any mod Empire, Napoleon and Shogun 2 Total War games, in just a few minutes. Friendly user interface and detailed documentation. No need of coding or scripting. Fully customizable produced launcher. Add your own background image, music, etc. 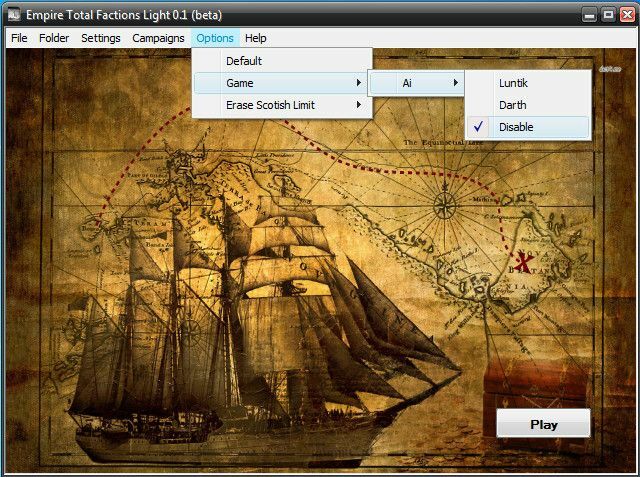 Add easily campaigns and options menus. Log report that helps player and modder to troubleshoot. Powerful and friendly user interface. Can handle unlimited campaigns and options. Can manage: mod, movie and boot pack files, startpos and region.esf, saves and ui.templates, and scripting.lua. Creates/edits game's user script automatically. Checks game's data folder for possible errors. Keeps backup and restores vanilla files if needed. Auto or manual game start. Produced launcher are more powerful and simpler than those used by American Civil War or Empire DarthMod, which are considered my best launchers. Easy Launcher is not addressed only to modders. It is suitable to for the players as well , who want to use a mod or a combination of mods they like. With Easy Launcher players can make a fancy launcher where they would be able to enable/disable and run those mods with one click! * Fixed a problem with updating of game path locations. * Fixed a problem with checking Napoleon data folder. * When uninstalling a backup of saves is created in Documents. * Added some more infos in Help like web, etc. * Infos dialog added in menu Settings, Properties. When you first creat the launcher, wizard asks you some infos. These infos were not editable. Now you can edit them with Properties menu. If you update from an older version: when you will load older saves to work with, select menu Build -> Repair, to update your launcher with the new files. To uninstall Easy Launcher run uninstall.exe, located in Easy launcher directory. First download the tut_files.7z, extract and place a) the ETFL mod folder where ever you like, b) the etf_l.sav in Easy Launcher's directory, Archive folder (that is the saves folder). Start Easy Launcher and recreate a new ETFL launcher following tutorial and using the included files. Or load the included etf_l.sav and check its content. For having etf_l.sav fully functional, after loading, you have to go in Settings, Properties and change the modfolder path. Enter there the path where ETFL folder is now in your machine. Then select Build, Preview to update new path and you are good to go.If you update from an older version of Easy Launcher select Repair before Preview.